Bruggen Blog: Meet this "Tubular" graph! Many of us know London. Those of us that have visited London will know "the Tube", "the Underground" - simply the fastest and most efficient way to get around (although I must admit that Hailo has been quite a contender lately...). Beautiful city, lovely place to work, and since I started working for Neo, it feels a bit like my home away from home. As you can easily imagine, or just plainly see from looking at any of the maps of the tube, the Underground really is a very sophisticated system, and can only be described as a very sophisticated graph. 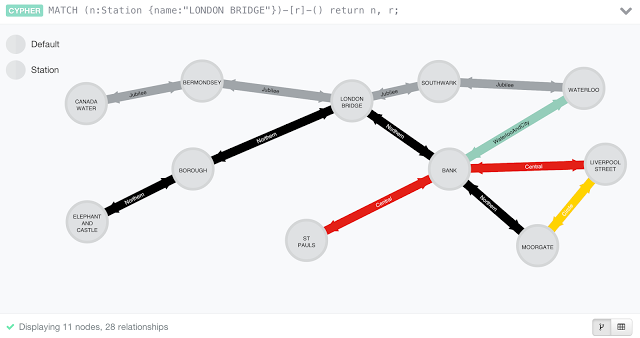 We always refer to it - in our Neo4j presentations - as the perfect example of how one-page-graphs can easily represent and provide *insight* into complex system ... without having to have a PhD in maths. 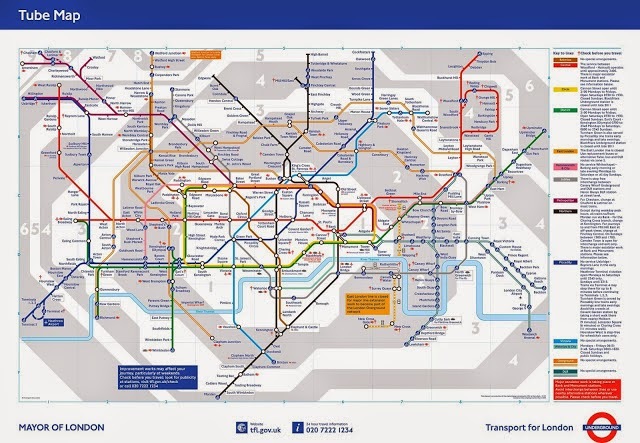 Literally: almost everyone can use the tube - almost everyone can use a graph. 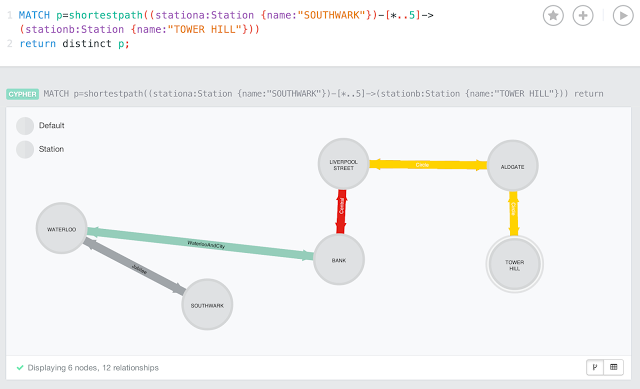 Since we talk about this example all the time, and since I am indeed an avid, non-native tube-user, I thought it would be interesting to look at how I could fit the Tube system into a neo4j database. 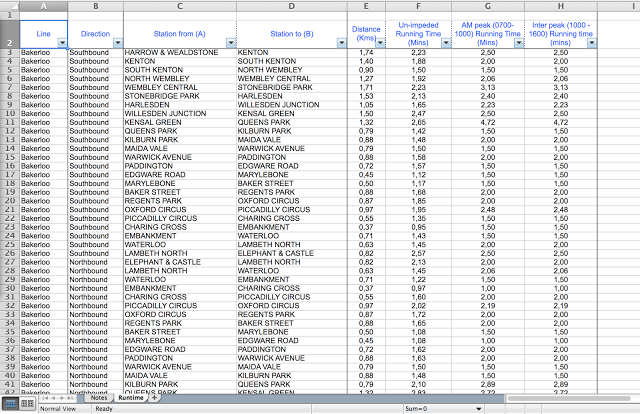 It took me a while, but of course the data is out there: this page links to this spreadsheet that has a very nice starting point. It contains the Line, the Direction, the Stations, the Distance between stations, and then 3 different time measurements between the stations. Importing this into a neo4j database is really, really easy. 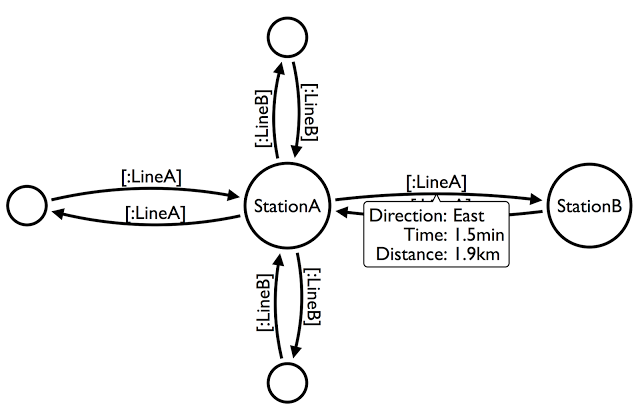 In other words: Stations have to be unique, are connected by one or more "Lines" in two directions, and the "Lines" have a "Direction" property (east, west, north, south...), a "Time" between stations property (which can be different in opposite directions! ), and a "Distance" between stations property. All in all it is very simple and effective. The resulting graph.db directory is over here. Ever since it's introduction at GraphConnect San Francisco, the neo4j browser has become my favourite place to play around with neo4j and cypher. One of it's coolest features is the ability to apply stylesheets to your graph visualisations. 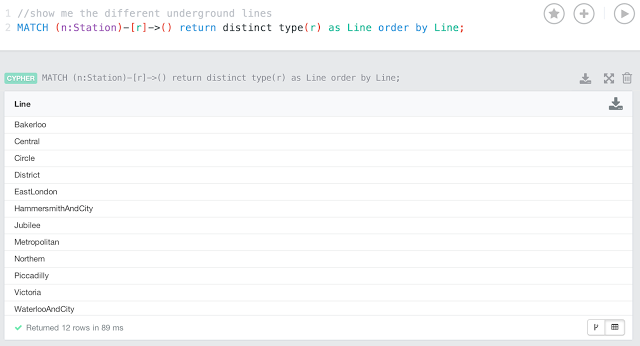 So I wanted to apply this to my new tube-graph, and use the "official" tube-line colours in the browser. So then all I had to do was to download the .grass file from the browser, and start editing the "relationship" sections. In the example below, the .Circle and .Central are the names of the relationship types "Circle" and "Central". Logical. You can download the full .grass file that I created from over here. 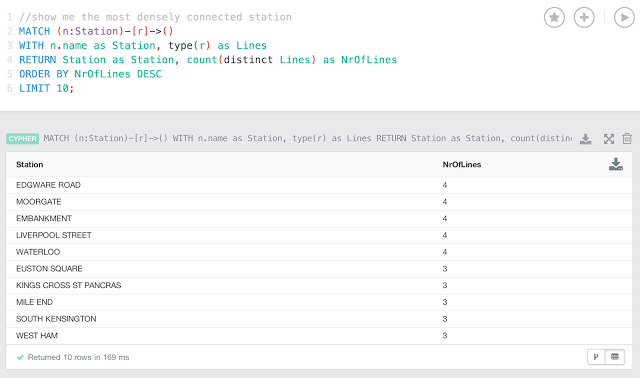 But of course the real fun begins with the queries. With "densely connected" meaning the most different underground lines passing through it. Of course we can do some rudimentary pathfinding in Cypher. But it's rudimentary - and just included for fun. Let's say that I would want to go from Tower Hill to Southwark (one of the most tedious tube connections that I would take sometimes to get to our London office). Anyone a bit familiar with London knows that this is "b*ll*cks", and noone would ever do that. The right thing (I think) to do is to take the district/circle lines from Tower Hill to Blackfriars - and then just walk across the bridge to the office. Easy. That's about it for now. 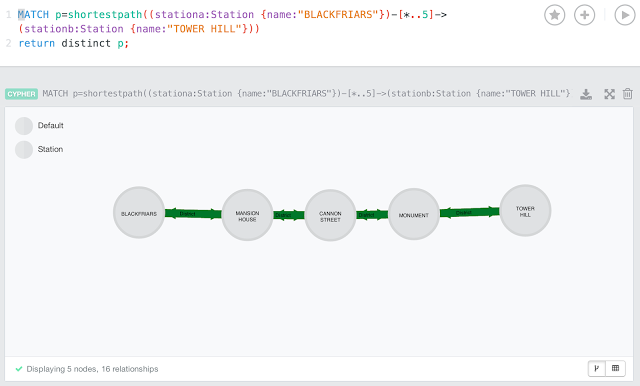 I think I have demonstrated how easy it is make the Great Tube Graph even greater by putting it into a graph database like neo4j - and how you could easily use something like the neo4j browser to find your way around one of the world's most complicated networks. According to http://stackoverflow.com/questions/16104303/neo4j-is-it-possible-to-use-regular-expressions-in-relationshiptypes-with-cyphe it's strongly advised *not* to use relationship type to store data. Imho the tube-name is data and thus should be stored in a relationship property. For a small example like this it's fine and nice to play with, but you shouldn't use this method in a real-life growing database. I would agree. 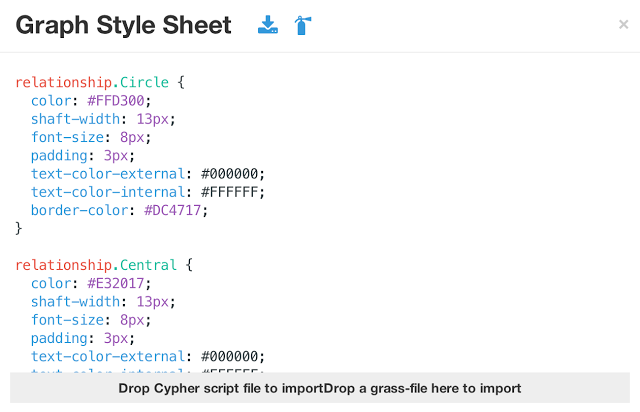 With a simple cypher statement you could replace the label with a more generic one, and set a property to the Line name.